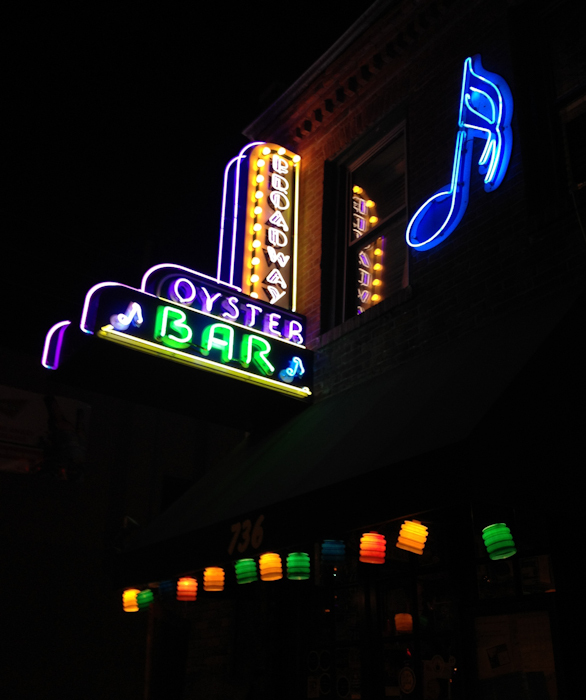 Last night at around 8pm we showed up at the Broadway Oyster Bar (over near the Soulard area of St. Louis). We drove past the place earlier in the day when we were exploring and it had the right look. Inside had the right look too–nice bar, small tables, funky vibe. There were several people at the bar and a few at tables, and we chose a table that looked like it might be near where the band would be playing in about an hour. The specialty here is Cajun/Creole food and they do it very well. We had some chargrilled oysters (six fresh shucked oysters grilled over an open flame with garlic butter, creole spices and grated parmesan/romano cheese), some snow crab legs, and the alligator sausage and shrimp cheesecake. It's a savory "cheesecake" (a bit like a slice of pie) with shrimp, alligator sausage and a blend of cream cheese and warm gouda cheese, and holy crap it was incredible. Don't let "alligator" or "cheesecake" scare you off of this if you go…it was one of the most delicious appetizers ever. After a little bit the band came in and relocated the guys who were sitting at a table on what was about to become the stage and began setting up their equipment. The band that played last night is the band that plays every Monday night at the Broadway Oyster Bar: The Soulard Blues Band. They were a fun and talented bunch. The place was full when we arrived and by the time we left around midnight it was packed. On Monday nights all sorts of other musicians show up and the band invites players one or two at a time to sit in and play. I love this part for many reasons. It's great to see the guy at the back with his guitar, fidgeting as he nervously waits to be called up, but it's even better to watch him settle in with the band and do his thing, having that moment where he's "in the band" and killing it and people are clapping and cheering him on. Also, I love the politics and hierarchy that is visible with regard to the "who goes up when" order. When I lived in Los Angeles I used to regularly visit a blues club down on Central Avenue called Babe & Ricky's Inn. This place was legendary. It was owned and run by a woman (in her 70s when I first met her) named Laura Mae Gross (but everyone just called her "Mama"). Mama was born in Mississippi in 1920 and moved to California with her husband in 1944. Her husband was robbed and killed in 1957 while cashing his paycheck. They had kids to take care of so she went into business for herself and opened up "Laura's Bar-B-Q." Seven years later she took over the Atlantic Club in South Central that had become famous during the Central Avenue jazz scene that began in the 40s. Anyway, all this just to give you the feel for this woman before I describe the place. My first visit to Babe & Ricky's was on a Monday night. There was a cover charge. It was $2 and you got a little red ticket that you'd exchange later for dinner. (Dinner!) 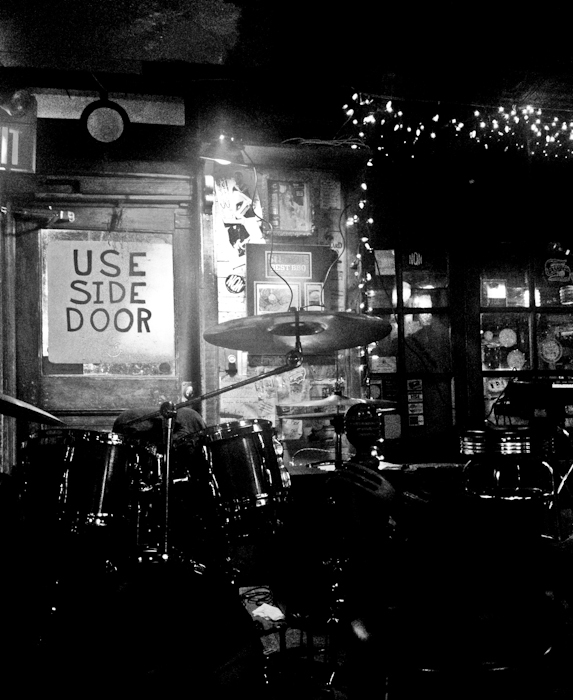 As you walked in the front door, the bar was on your right and the stage was on your left and there was just a walkway's worth of space between the barstools and the stage. If you sat at the bar and turned your stool around to watch the band, you were eye level and about 4 feet from the guitarist. Past the stage/bar corridor, the kitchen was on the right, and on the left and straight toward the back there was a pool table (most often covered with a tablecloth with some chairs around it) and a few booths and tables. Mama usually sat in a booth on the left and cut her path between that booth and the kitchen where on Mondays she cooked up dinner for the whole place: fried chicken, collard greens, black eyed peas…some spicy sausage. On nights when Mama wasn't cooking she'd often have her long black hair down, wearing a pretty dress and a sparkly hat. I don't think she cooked in the sparkly hat. This was a musician's hangout. Monday nights were jam nights and all sorts of musicians dropped in and played. I saw players from Buddy Guy's band, Keb Mo, local legends like Mickey Champion and Deacon Jones, and on and on and I probably saw famous players I had no idea who they were. Everyone was treated the same, mostly. But if anyone got up there and wasn't playing the blues, Mama would tell them loudly "That ain't the blues. This isn't no Top 40s club" … and that they either needed to play the blues or get off the stage. She'd decide and call out when it was time for a particular player (usually one of the amateurs) to go on stage and when to come down. It was fabulous to watch the way she guided and nurtured the aspiring blues musicians. "These are for the drummer and the horn player, sitting at the end of the bar now." "This is for Jeff, the white guitar player." "Give this one to Boom Boom." The musicians were always fed first, of course. Sometimes she'd need to point out who was who, but after a couple Mondays I knew who everyone was. "Now these are for those lovebirds in the back booth." A couple years later I moved to Portland to go to art school, met Kevin, and settled in the Pacific Northwest. One time during a visit to Los Angeles I decided to take Kevin down to Babe & Ricky's. It'd been a year or so since I'd left Los Angeles. We walked in and I grabbed Kevin's hand to lead him back past the stage to greet Mama in her usual booth. She was wearing a purple dress and a purple sequined pillbox hat (it was a Friday night, I think) and she got up with her huge smile and her outstretched arms and gave me a big hug. "I haven't seen you lately!!!" I introduced her to Kevin and she shook his hand warmly and gave him her huge welcoming smile. At the end of the pool table, right near the stage, there was a new bench for two. It looked like maybe someone had made it for the club or for Mama and it had a red velvety cushion on it, and a little satin corded rope tied across from arm-to-arm. She untied the rope and gave us the best seat in the house…like she'd been saving it all along just for us. 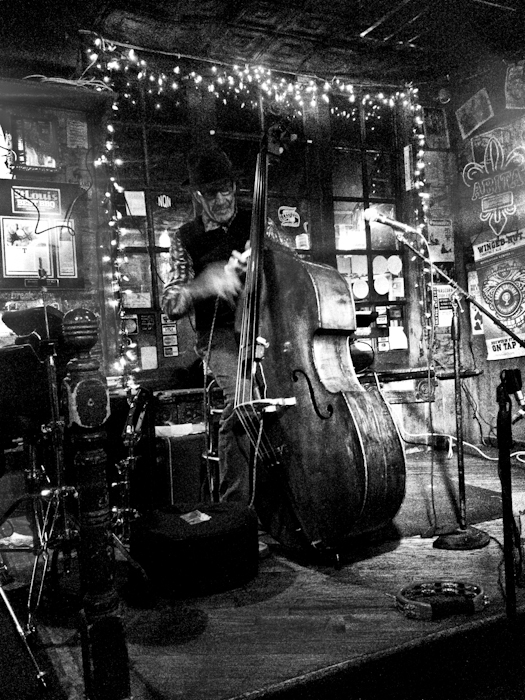 I know, I got off on another story about another place completely, and I guess what I'm really thinking about is that even though the blues club last night was a great time with good music, friendly staff, and great food, there will likely never be another place like Babe & Ricky's for me. Here's a link to the club website (still up) with a bunch of history. And here's a link to the L.A. Times article about Laura Mae after her death in 2009.